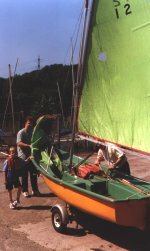 The club was established in 1967 by a group of enthusiasts who enjoyed a common interest in sailing. At the time of the inaugural meeting on the 27th November 1967, held in the Council Offices of Bredbury & Romiley, Mr. C. G. Milledge outlined his proposal for a Sailing club to cater for the residents of Bredbury & Romiley and thus the Bredbury & Romiley Sailing Club was launched. The agreement between BRSC and Bredbury & Romiley Urban District Council was signed on the 3rd July 1972 and confirmed by the Secretary of State on the 16th November 1972. The founder members were Frank Grisbrook, Harry Whitehead, J. Hurst, C. G. Milledge and W. Browning. The original premises was the Wooden Hut situated next to the boat yard, with no electricity and an outside chemical toilet! It wasn't long before social events were organised to raise funds and with assistance from the Sports Council the present Clubhouse was built in 1974. In 1987, whilst Jim Walsh was the Commodore, an extension was added to the rear part of the clubhouse to improve the bar, kitchen and lounge space and as an added bonus, a basement was created which has at present a duel role of male changing room and general storage. We have been host to many National events including the Otter Championship and several Junior open meetings. Two Junior National Champions, Lesley Ingleson and Andy Potter, both started sailing here at the Etherow Country Park. The club is extremely ambitious and looks forward to a successful future, it actively supports youth sailing with Stockport Youth Service and the District Scouts. 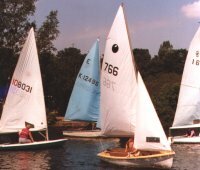 We are the only sailing club in the borough of Stockport and for the past 30 years have provided sailing and other water sporting activities to the community of Stockport and surrounding area. We host an annual charity raft race with Marple & New Mills District Round Table, whilst club facilities are used on a regular basis by many groups associated with Etherow Country Park.